Learn with Lee: Real Estate Coaching and Consulting: You’re Frustrated with Your New Client But Is It Your Own Fault? You’re Frustrated with Your New Client But Is It Your Own Fault? Excerpt from Plan to Win! Have you ever expressed frustrations similar to the following? "He always calls at the last minute to view a home!" You are nice to your clients and give your all to the real estate relationship with them. However, have you noticed they do not return the favor? They are out schmoozing other agents’ listings without you. Or, they are off “canvassing the town” for buyers. Perhaps, it may seem they are doing everything possible to sabotage their listing from selling. If any of those sentiments resonate with you, then you may have never used what I like to call an Expectations Contract. You may call it something different but an Expectations Contract is a written email, letter, infographic, form (TypeForm is a fun option), or whatever else that fits your style of written communication that makes sure everyone is literally on the “same page”. 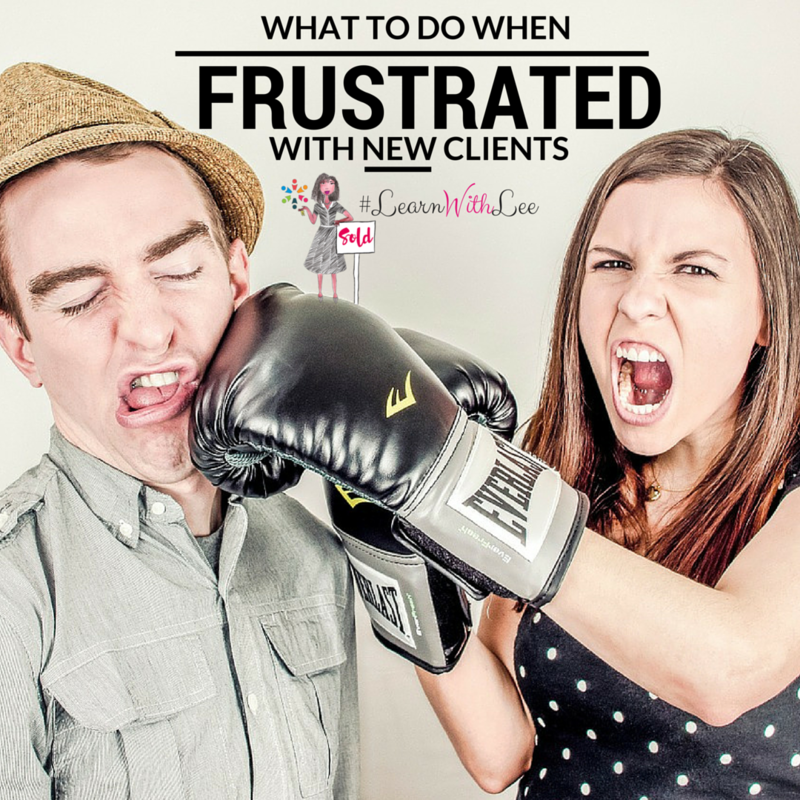 Your clients should not work against you, unknowingly undermining your efforts to help THEM. But many times how to function on the same team towards one common goal (to buy or sale real estate) is NOT obvious to our new clients because they have seen and heard conflicting things about the process from TV shows, neighbors, coworkers, and even family. That is why it is important that you clear the slate. Give them an opportunity to express their expectations of you and the process while also communicating your desire to serve their real estate needs according to your particular method. Your new client may be a buyer or seller, a Baby Boomer or Millennial, a first-timer or a savvy investor, a lifelong friend or a new acquaintance. Regardless to your client's station in life or familiarity with you personally, make it your aim to enter EACH new client relationship by clearly laying out and setting expectations. You likely work differently than the last agent they have had (if this is not their first deal). If it is their first real estate transaction, how much more vital it is for you to “set the table” so they understand what to expect of you and themselves. My mom (being the wise, retired LMSW school social worker she is) has repeatedly tried to instill in me what she taught her students for years: “you have to teach people how to treat you”. Variations of this proverbial advice has been attributed to popular speakers from Stephen Covey to Dr. Phil so I am not sure who to ultimately credit but this should be your foundational statement as you embark upon a new client journey. First, seek to understand (before being understood) by asking your clients what their expectations are so that you can best serve them. How and when does your client prefer communication (i.e. text in the mornings, calls at night, emails, etc.)? *Tip: If phone is preferred, always follow-up with an email reiterating verbal discussions to keep a paper trail and protect your business. When are your clients available to view homes (if buying) or have their home shown (if listing) (i.e. only weekdays between 5 - 7 pm, etc.)? *Tip: Don’t just follow your schedule but try to identify optimal times for both you and your client to help make this process easier for your clients. What other expectations do your clients have (i.e. weekly reports, home previewing, etc.)? Next, explain how you work to best serve the needs of ALL of your clients effectively and efficiently. It is reasonable to tell your new clients that you work by a schedule (and not on a whim) to ensure all of your clients (not just a couple that tend to monopolize your time) have an enjoyable real estate transaction. That you welcome their questions - you are their trusted professional and can give solutions relevant to their specific transaction as opposed to generic information found online, mentioned in a TV show, or from a non-real estate professional that may not be pertinent. The safety requirements of your office (i.e. copy of driver’s license, etc.). The documents needed to get rolling (for buyers this may include proof of funds if buying cash or a pre-approval letter; for sellers this may be the verified pay-off amount, lease documents if tenant-occupied and so forth). Your showing schedule and process. A commitment from them to the process - be sure to explain what they can expect from start to closing day (and even after closing day). 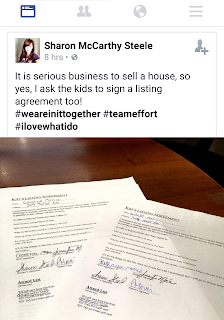 This commitment should include anyone pertinent to the transaction like children that may live in the home being listed, etc. A commitment to you as their trusted agent - explain to them your commitment to provide them with top-notch expertise and resources, and the loyalty with which they should reciprocate. For example, for buyers you may need to spell out that if they are interested in homes other than what you have shown them, that they will consult with you for information, showings, and offers as you represent their interests (unlike the seller or the seller’s representation). As another example, for sellers, explain that you can only protect their interests if they apprise you of additional offers they may receive. Encourage and reassure your new clients that keeping you in the loop from start to finish ensures that their interests are best protected and their negotiating position is not compromised. Kudos to Sharon McCarthy Steele - she gets it! She created a listing agreement for the homeowner’s children to make sure that everyone is playing for the “same team”.